As a personal finance blogger we thought you might have interest in Prosper (www.prosper.com) and peer-to-peer lending. You may know that Prosper was the first peer-to-peer lending marketplace in the US. In 5 years, we have originated over $215 million in loans on our site. Which is all well and good until it is YOU that suffers the statistical loss/es (you can get unlucky and lose on a number of your loans); I don’t know about you, but I don’t like any system where I play statistical roulette without at least some measure (OK, illusion) of control. 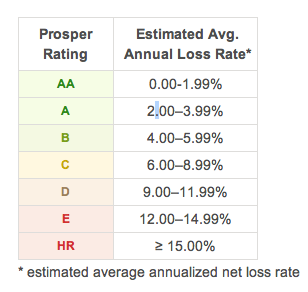 In fact, if this risk-rating-system is so good, why doesn’t Prosper simply knock out the competition by adjusting the interest rate earned by the rating-weighted loss-rate and carry the risk themselves?! But, what’s your for/against reasons? This entry was posted in Investing and tagged 7million, 7million7years, Investing, Starting Out by Adrian. Bookmark the permalink. If you were picking a few loans than the statistics are almost useless… However, say you are investing with 1000 (independent) $25 investments then the statistics should be a good predictor of results. I feel Peer to peer lending would be the most viable for large investors. The real question is would the interface be workable? Would the tax paperwork be reasonable? I don’t know as I don’t have $25,000 to try it. The problem with P2P lending is that it is between people that don’t know each other. If I have a great credit score, I can get a loan through a bank with similar interest rates – why go through Prosper? If I have a bad credit score, why would people that don’t know me lend me the money at below-market interest rates? What value does P2P have over Banks? For low credit score individuals, there is some. But for lenders or people who want to get a decent return on their money – there are much better alternatives. I’m for it as a learning tool, not as a key portion of one’s portfolio. They have previous loan data that can be analyzed, one can learn the many reasons why people get into debt, and experience loss of capital with no collateral. When my children are older, I’m going to use it as part of their economics lesson (part stock market, part P2P, part business creation). Disclaimer: I do have 29 current loans on Lending Club, had 2 loans on Prosper and both defaulted. The week one of the loans is late paying, I put it up on Lending Club’s trading platform at a discount. I had 1 loan in the past year that had that happen and was able to sell it. The basic problem with P2P lending is that in order to take advantage of the statistics you need to have a lot of loans outstanding. The additional time spent administering and monitoring the loans is better spend elsewhere (IMHO). In theory it should be possible for P2P lending to be a win-win. Given that individual lenders do not have the same overheads and regulatory capital costs as financial institutions it should be possible for credit worthy borrowers to pay less than they would on a loan from a bank and lenders to earn more than they would get on deposit. In reality, I would expect that the more limited knoweldge that the lenders will have about the borrowers’ circumstances will wholly or partly negate that advantage. I like the idea of P2P lending in theory, which is one reason I poured about $8K into Prosper.com from late 2006 to early 2008. But I quit putting money in about that time because my loans were NOT performing. My last one is just about to pay off, and I’m too lazy to go look up my account right now but I’d estimate that 65% of my loans completely defaulted and were charged off. Most of my ratings ranged from C to E with a few HRs in there (the HRs ones weren’t the ones that defaulted btw). Also Prosper conveniently does not provide you with your personal rate of return on the site. You’d have to do some massively complex calculations to figure it out, which I might sit down and do one day – or I might not. One thing is for sure though, I’m done with P2P lending. I’d rather lend to family members or people I’ve met in person if I want to get into that biz. @ Meg – Hint: Register LoanSharksRus.com; hire a Right Hand Man named “Fat Louie”. Thanks for sharing! I don’t think I would ever use (or invest) in something like this ,because banks take risks(but normally manage them well)but with something like this, your loaning money to someone you cannot know well. You have never met this person(and most likely never will). So how can you get a sense of who they are or what they are all about?How do you know they are employed? How do you even know they are who they say they are? Very risky situation.True ,many are who they say they are, and just looking for an easier way to borrow and might even pay you back, but you don’t know this when you loan this money to them. If you could sit down with them in person, ask many questions, check them out ,talk to their boss, their neighbors,friends etc.,it might be different. I have about $1,100 in a LendingClub account. Over the last year or so, I’ve had one of my 50+ loans default, and another soon to do so. I earn enough interest in a few months to cover these defaults, and in fact have made about $60 in interest on my $1,100. This is way more than you can get in any savings account, and as my number of loans increases, the risk will decrease and my net annualized return of 7.5% will continue to rise. Banks take risks largely based on the same information I have access to: chiefly credit score, but also debt-to-income ratio, time with employer, monthly income (often verified by LC), rent vs. mortgage vs. own, etc. Every single loan is vetted by LC, and the lowest FICO score they’ll even consider is 660. So, there you have it: I’ve risked a tiny percentage of my portfolio, just to try this out. By targeting loans with high FICO scores (usually 750+), stable jobs and money in their homes, I am confident most of my loans will not default. And as I get close to LendingClub’s magic number of 100 loans, I worry even less about loans defaulting, let alone losing money. A sample size of 2 does not guarantee anything. That’s why polls often ask 1,000 people–otherwise the results are meaningless. You can’t judge P2P lending on 2 accounts. One loan may be extremely risky, but 100 or 1,000 just isn’t. That’s the power of statistics. Although I can’t talk to borrowers in person, I can ask whatever questions I want. And because I’m a reasonably intelligent human being, I can tell if loans are legitimate or not and whether I think people can pay them back, just by reading the description and their responses to questions. And if I’m wrong, who cares? I might lose half of the original $25 I loaned them when it defaults, but I’ve already made enough interest in a couple months to cover that rare default. I can choose to loan money to people for their weddings, new babies, to build a pool or go on that dream vacation. Many of my loans are to people trying to get out from some bank’s arbitrary rate increase on their credit card. And we do all this lending outside the giant banks who pay me 1% on my savings account and charge people 20+% on their credit cards. By cutting out the banks, we both get a good rate. I spend about half an hour a month reading loans and investing the $50 I deposit monthly (plus the payments I receive). It’s fun, profitable, and keeps me actively involved with my money, much more than I can say for my bank savings account. I have learned…..”If you want to loose a friend, lend him some money”…. Dave-you spent 6 paragraphs explaining the virtues of P2P lending and close with the question – “where’s the downside?”. Yet, you admit that your investment in this is “tiny”. I’m curious, if P2P is so great why wouldn’t you make this a large percentage of your portfolio? Jan says;I have learned…..”If you want to loose a friend, lend him some money”…. How sad for you Jan , your willing to give up a friendship over a little loan. I have loaned money to many , (never do I expect it back if they are family or friend). Money isn’t the be all end all in life. I realize when I loan this money , that there is every chance it won’t be coming back, but it is no reason to lose a friend.Call it a gift to someone you care about.Simple as that. We don’t do this every day and we sure as heck don’t do it in business, but for family or friend, its quite different. @Adrian: yeah I’m don’t know the math behind 100 either, but it has something to do with your average interest rate and expected % of defaults. @Bob: you got me there. I guess I’m still trying to convince myself (and the wife/CFO!). Dave, you aren’t comparing apples to apples. The rate of return from P2P lending is better than a savings account – of course. A savings account is FDIC insured, a P2P loan is not. Compare P2P lending to investing in stocks and how do the returns look?